I am a big Star Wars fan. Ok, a HUGE Star Wars fan. I know way too many lines from those movies. But, despite my cinematic geek tendencies, my vast space movie knowledge will prove helpful for this article. “The force is strong in this one,” as they say! Did you know there is actually a Jedi religion? Yes, there are Star Wars fans that, in their dedication to all things Lucas, have gleaned a theology of sorts from the Star Wars films and adapted it for everyday use in their day to day lives. I’m not kidding, seriously, stop laughing! Upon closer inspection, it appears that Jedi-ism is a conglomeration of world views. These beliefs share themes such as loving your neighbor, doing good, avoiding evil, being good stewards of the Earth, etc. All good principles, for sure! When we talk about addiction recovery, no conversation is complete without discussing the issue of prayer and meditation. Regardless of one’s theological preferences, prayer and meditation are important in the life of recovery for several reasons. First, prayer is the way that a person communicates with his or her higher power. It is a way to laugh, cry, vent, yell, scream, plead, and thank our higher power for the things we experience in life. It is the language of relationship with our higher power. Remember, our higher power is just that, a power greater than ourselves that is living and cares intimately about the details of our lives. As in all relationships, communication is essential to grow the relationship. Otherwise, it becomes stale even lifeless. Therefore, step 11 calls us to be in contact with our higher power on a daily basis through prayer. If prayer is speaking to our higher power, than meditation would be the act of listening to our higher power’s answer. I once heard someone respond to the question how does our higher power answer our prayers by saying, “Our higher power answers with three words…yes, no, and wait.” I think that is a great way to understand prayer requests we make to our higher power. There is always an answer even if it is not the answer we want to hear. In meditation, we intentionally set aside time to reflect on our lives. It is a time to look inward and take stock of our thoughts, feelings, and impressions we receive from our higher power about the people, places, and things that direct the course of our lives. If we are quiet and listen, we will hear the faint, whisper of our higher power calling out to us with wisdom, guidance, and direction. The practice of Step 11 is essentially a daily renewal of the reality we came to accept in Step 1, namely, that we are powerless over alcohol and drugs and that our lives had become unmanageable. The practice and renewed commitment of such truth will yield healthy results in our day to day lives. When we practice these habits, we remain right-sized. By being right-sized, we remain humble and thus are teachable. No one can accept help from an extended hand if his/her own hands are full. We must drop our preconceived notions and highly regarded opinions and open ourselves up to the reality that we are small, finite creatures in need of an infinite power that is greater than us to help us continue on the daily path of recovery! The treatment options for patients with an addiction to opiates - Heroin, Percocet, OxyContin, Methadone, etc. - have been very limited. Patients who try to go drug free have not been very successful because the pull back to the opiates is so high that almost everyone relapses within the first three months. The relapse rate is so high in fact that, many years ago, the government essentially gave up on the idea that most patients could go drug free and recommended giving them a highly addictive substitute drug called Methadone. Finally, this month the FDA has now approved Vivitrol – a monthly injection of Naltrexone that helps patients stay off drugs. What are its strengths and weaknesses and how will it fit into the treatment landscape? Naltrexone is a powerful opiate blocker. If patients just took it, Naltrexone would completely prevent them from relapsing. But patients don’t take it. It doesn’t make much sense, but study after study has shown that patients don’t take oral Naltrexone. It has been available in an oral form since around 1982. The pills last about 24 hours and they definitely do work. But patients don’t take them. It is hard to understand why patients wouldn’t take a medicine that can completely prevent them from relapsing back to Heroin or OxyContin, but they don’t. The only way I can think about it, is to just accept this fact as evidence of how amazingly powerful the addiction process is. If there was a pill that prevented cigarette smokers from smoking, would they take it? It is an interesting question, and now there is somewhat of an answer. Chantix is a pill that blocks nicotine and is now approved for use with cigarette smokers. It does block the effects of Nicotine but the research shows that, at the end of 12 months, only about 7% of smokers are still quit. So maybe the experience with Naltrexone is not so different. For over 30 years, physicians have realized that if they could just force patients to take their Naltrexone, then the patients would stay off heroin and other opiates. Some research was done with prisoners and sure enough since the prisoners were forced to take it, they stayed off drugs. But this is unrealistic in the real world. Early research was done around 1980 with long lasting Naltrexone injections but there was some tissue reaction and the research was abandoned. Then some Naltrexone implants came on the market and a few physicians started to use them. Here at the Coleman Institute we started to use Naltrexone implants around 1998 and we have been using them ever since. We have had great success. Patients usually lose all cravings and seem to recover from their post acute withdrawal symptoms quicker. Over the years better implants have come along. The original implants lasted only 4 – 6 weeks. We are now using implants that last over 3 months in half of the patients, and we are about to start a small research study on implants that may last 6 months. Now Vivitrol has been approved by the FDA for the treatment of opiate dependence. Vivitrol is a one month injection of Naltrexone microspheres. It is a pretty cool technology. The Naltrexone is mixed with poly-lactates. Lactic acid is a natural breakdown product in the body so it is very safe. Poly-lactates are molecules where the lactic acid has been linked together into a chain which takes the body some time to break down. Poly-lactates are used in absorbable sutures. To make Vivitrol, the company takes poly-lactate powder and mixes it with Naltrexone powder and then makes the final powder into small spheres – micro spheres. The microspheres are small enough to go through a syringe and large enough to take one month to fully break down and release their Naltrexone. The result is a medicine that can reliably deliver Naltrexone for one month. Like all medicines Vivitrol has some advantages and some disadvantages. It is an injection which means patients can’t not take it. It reliably gives them Naltrexone for a whole month. One advantage is that Vivitrol treatment is easier for patients than our implants - just a simple injection. Also if patients have insurance there is a chance the Vivitrol may be covered, although it is not clear yet just how generous the insurance companies are going to be. The medicine is very expensive. On the negative side is the fact that once Vivitrol is injected into the body, it can’t be taken out. The Naltrexone implants we use can be removed in the rare situation that patients need to get narcotic painkillers. With Vivitrol you really have to wait one month until it wears off before you can get any pain relief. While this is rare, it did happen with one of our alcoholic patients last month. He got an implant but started drinking again and developed pancreatitis. Pancreatitis is extremely painful. Fortunately for him he had an implant and we were able to have it removed, so within 24 hours he was able to get good pain relief. Vivitrol is also very expensive. Without insurance, it usually costs over $1100 for one month of treatment. I don’t know of many patients who will be willing to pay $1100 month after month. Our Naltrexone implants are only about $250 per month which is much more affordable and is actually much cheaper than most Methadone programs. A very important thing to know about Vivitrol is that patients must be fully detoxified before they can start on it. If patients start on any form of Naltrexone while they still have even tiny amounts of opiates in their system they will go into complete withdrawal which is very painful and can be very dangerous. Getting patients fully detoxified so they can get started on Naltrexone is not easy. Suboxone is now being used by some doctors for detoxification, but it is a very long lasting opiate and so patients need to be off Suboxone for at least 14 days before they can start on Naltrexone. Most patients will relapse back to their street drugs before the 14 days is up and then they can’t start on Vivitrol. We have over 12 years experience now in helping patients detoxify before they start on Naltrexone therapy. Most patients are simply not able to detoxify themselves and need medical assistance. Our Accelerated Opiate Detoxification (AOD) program uses light sedatives and other medicines to make patients comfortable and actually speed up the detox process. It is an outpatient program that patients find very easy to complete. Our success rate in getting patients onto Naltrexone is over 98%. In summary, I think it is fabulous to have Vivitrol available for opiate addicts. It works well and will be a good option for a lot of patients who don’t want to be on Methadone Maintenance or Suboxone Maintenance. Some patients will be lucky enough to have the medicine covered by their insurance plan, but others may be able to use Naltrexone Implants as an alternative. All physicians and patients will have to be very careful to make sure that patients are fully detoxified before they start on this new treatment. 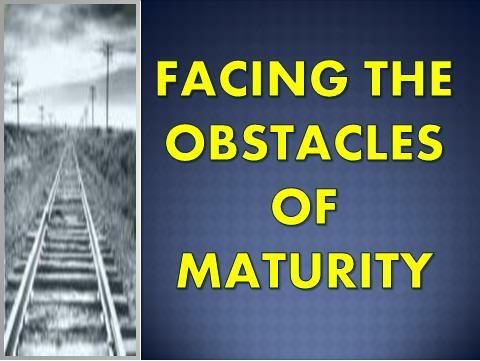 Facing the Obstacles of Maturity: Using the "Maturity Prayer! “God grant me the maturity, to accept what I am feeling, and the courage to correct the actions that I took that made me feel this way"
Maturity can be defined as, “full development or perfected condition”. In the case of the Maturity Prayer’s opening statement, “God grant me the maturity (full development, perfected condition) to accept what I am feeling", we are invited to accept our feelings as they are. This is especially difficult when we perceive them to be negative. It is a hard thing to do. We ask God to give us the ability to recognize and accept our feelings particularly as it relates to our part in creating those feelings. While it is true we may have strong feelings about a certain situation or person, place, or thing, the reality is the only thing we can change in life is ourselves. The prayer continues saying, “the courage to correct the actions that I took that made me feel this way.” This is the second and also difficult part of maturity, namely, correcting negative actions for which we are responsible. In the end, this prayer is all about asking for the power to better manage ourselves. While maturity may not be highly rated, we can definitely say that immaturity is definitely overrated. Which will you choose in the face of obstacles that threatened to stunt your maturation process? We live in a society that is focused on quality. A major car manufacturer even uses the word in their marketing campaigns…”Quality is job #!” – Ford Car Company! Why all this emphasis on quality? The word itself stands for, “a degree of excellence”. Thus, if one is to make an excellent product, provide an excellent service, or engage in excellent business products, he or she would be said to be providing “quality” in each of these areas. In a related sense, people are often defined by their individual, unique qualities. Fiery red-hair. Deep blue eyes. A dry sense of humor. Bad breath. You get the point. People have both good and not- so-good qualities that we get the joy (or pain) of experiencing on a day-to-day basis. For example, movie goers always seem to experience of sense of refinement and civility when they watch Sir Sean Connery act in a James Bond movie. He is known for such qualities. What qualities are you know for? The Book of Qualities by J. Ruth Gendler is a fascinating, creative look at some of humanities common personal qualities and how they affect our lives. This makes for great reading when dealing with an addiction. Part of recovery is dealing with those qualities (read character defects) that trip us up and make us fall into our addiction. A few of these qualities include, but are not limited to, rage, jealousy, resentment, boredom and fear. If you’re looking to understand more about your own inner qualities, this is an excellent book. Each quality is described in about a paragraph or two so it is quick and easy to read. Many of the qualities have artwork as a visual representation of the printed description of that quality. I encourage you to read this little gem of a book. Who knows, in the end you may end up discarding out-of-date qualities and replacing them with new and fresher ones! I’ll end with this quote on ‘Change… “Change is very musical, but sometimes you must listen for a long time before you hear the pattern in his music” (p. 33).